This set of Compilers Interview Questions and Answers for freshers focuses on “Non – Deterministic Finite Automata – 2”. Explanation: In order to convert NDFA to DFA we work with sets of state where each state in the DFA corresponds to a set of NFA states. Explanation: A regular grammar takes in all strings over an alphabet. Explanation: subset construction is used to convert a NFA into DFA. Explanation: Like DFAs, NFAs only recognize regular languages. 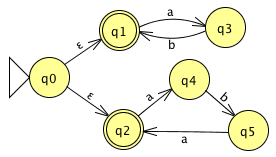 Explanation: The NDFA initially takes either a or b followed by a then b then reaches the final state or takes iterations of a or b to reach the final state. Explanation: As per its definition. 7. For every NFA a deterministic finite automaton (DFA) can be found that accepts the same language. Explanation: Therefore it is possible to convert an existing NFA into a DFA for the purpose of implementing a simpler machine. Which is executed by using the powerset construction. Explanation: It is a known fact. 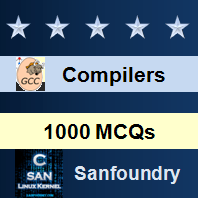 To practice all areas of Compilers for Interviews, here is complete set of 1000+ Multiple Choice Questions and Answers.